Even though the current solar cycle (SC 24) is well-known for its relatively low level of sunspots, it can still produce surprisingly powerful bursts of ‘counter-intuitive’ activity, causing solar scientists to put their thinking caps on. A series of rapid-fire solar flares is providing the first chance to test a new theory of why the sun releases its biggest outbursts when its activity is ramping down, says Science News. Migrating bands of magnetism that meet at the sun’s equator may cause the biggest flares, even as the sun is going to sleep. A single complex sunspot called Active Region 2673 emitted seven bright flares — powerful bursts of radiation triggered by magnetic activity — from September 4 to September 10. Four were X-class solar flares, the most intense kind. The strongest, released at 8:02 a.m. EDT on September 6, was an X9.3. The most powerful flare since 2006 (and the eighth largest since monitoring started in June 1996), it disrupted shortwave radio communication over Africa for up to an hour. It also flung a blob of energetic plasma, called a coronal mass ejection, speeding toward Earth, which sparked auroras the night of September 7 that were visible as far south as Arkansas. All that activity is counter-intuitive, as the sun is near the end of an unusually weak solar cycle, which began in 2008 (SN: 11/2/13, p. 22). The sun’s magnetic activity waxes and wanes roughly every 11 years, generating more dark sunspots at the peak of the cycle and fewer at the trough. “This cycle’s a wiener,” says solar physicist Scott McIntosh, director of the High Altitude Observatory at the National Center for Atmospheric Research in Boulder, Colo. When the cycle peaked in 2013, it was already looking like the weakest in a century. 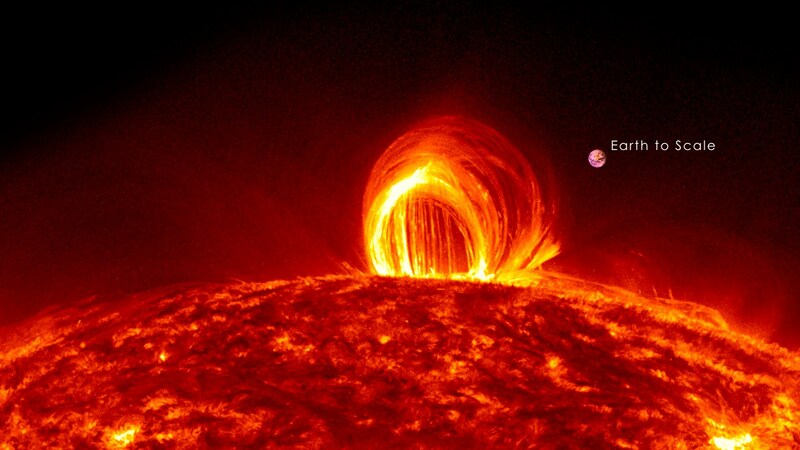 Solar physicists realized in the 1960s that the peak flare rate comes a few years after the sunspot maximum. Even stranger, the strongest flares tend to occur on the cycle’s downslope. The quietest cycles may even produce the biggest flares. The biggest solar storm in recorded history, called the Carrington event, occurred at the end of another especially weak cycle in early September 1859. Modern simulations estimate that flare may have been an X45. McIntosh has an idea why. In a series of papers, including a 2015 paper in Nature Communications, he and colleagues argued that complex sunspots like AR 2673 and their forceful flares are the result of opposing bands of magnetism vying for supremacy. causing solar scientists to put their thinking caps on. How about solar scientists putting their guessing caps on? Are Mexico’s two September earthquakes connected? Fluctuations of cosmic-solar radiations are charging the ionosphere. That results in anomalies of geomagnetic field which causes the generation of eddy current. The eddy current heats the rocks in the faults and consequently the shear resistant intensity and the static friction limit of the rocks would decrease. This is the main process that trigger earthquakes and volcanic eruption. During solar minimum high energy cosmic radiation can penetrate to a very deep distance below the Earth’s surface, in some case a few hundred kilometers. This is the reason why most if not all earthquakes during solar minimum are deep earthquakes. The stress on the Magnetosphere during solar minimum is higher because the Heliosphere is weaker and more high energy charged particles can penetrate the solar system. The sun’s recent activity has caught the interest of scientists and space weather forecasters worldwide, highlighting the need to keep a watchful eye on our star and its awesome power. Oldbrew, lots of earthquakes in last week, also Vanuatu, Toga, Fiji, Indonesia, Hawaii, Japan-near Fukushima.as well as Mexico and USA. In fact right around the ring of fire. I used to look at site on earthquakes and volcanos I think mentioned a few times here but have lost all the bookmarks when I had to reinstall Windows and Mozilla. can anyone help. The site had explanation as well as a map, times and strength (which are on the US Geo physical site) Can anyone help? However the site I was looking for shows the world’s earthquakes and volcanoes and tries to relate changes to things like changes to the magnetic fields and solar flares. Bali's Mt Agung is about to blow – alert level hits Level 4, evacuation area doubled to 12km. Look out! Last big eruption in 1963-4 killed ~1700. A 5.7 magnitude earthquake has struck off the coast of Bali, Indonesia. It was detected northeast of Kemeduran on Thursday, the US Geological Survey confirmed.